There are three Hunter products in the range created by UK-based Roar Ambition. I have already taken a look at Hunter Test and Hunter Burn and been pleasantly surprised by both (particularly the testosterone booster). Hunter Focus is a nootropic supplement designed to work well on its own, but also to work well with the other two products. This is a really cool idea by Roar Ambition — help men to boost their testosterone, burn some fat, and boost their brain power. It’s also marketing genius. Of course, Hunter Focus is also suitable for women too. Also known as Monkey’s head mushroom. Just let that sink in for a moment. Roar Ambition could have listed an ingredient called Monkey’s head but chose to go with Lion’s Mane instead. A waste in my opinion, but the good news is that this is a pretty decent ingredient to be honest. It helps to reduce anxiety, prevent cognitive decline as you age, and may even alleviate the symptoms of depression. Offers both neuroprotective and neuro-regeneration benefits. One of the most commonly used herbs for relaxation (that’s legal), Ashwagandha has lots of evidence for its positive effects on post-stress, cortisol, and anxiety. It may also be effective at reducing your blood pressure, reducing fatigue, and working as an anti-depressive. There is even some evidence that Ashwagandha may have a positive effect on testosterone production. The dosage is spot on. Choline is a common ingredient in nootropics, but sadly many companies often use the cheapest version (Choline Bitartrate) which has no effect on cognition. Roar Ambition has bucked the trend and has used a more expensive, but infinitely more effective version of Choline. Citicoline (also known as CDP-Choline) has lots of evidence backing up claims that it can increase attention and aid brain health. Higher levels of Citicoline, for instance, have been shown to potentially aid age-related memory decline by boosting brain energy and cell membrane repair, and aiding memory recall in the elderly. A 2012 study on healthy adult women also found that citicoline increased attention and reduced “attentional deficits associated with nervous system disorders”. Dosages were 250mg of citicoline, the same amount in Hunter Focus, and 500mg (or placebo). Both citicoline groups showed improvement, albeit the 500mg group produced the highest test scores. Standard dosage of citicoline is ideally between 500-2000mg, depending on the desire effect. Hunter Focus contains 250mg. While this might seem low, it is pretty standard in over-the-counter nootropic supplements and still has benefit, as highlighted in the study above. To increase your choline intake further, eat more eggs. Also known as Passiflora incarnata. This supplement is believed to reduce anxiety, and boost cognition, but more robust research is needed. It is typically used in sleep aid supplements because of its relaxant benefits, so its inclusion here is interesting. May have the possibility to improve performance by ensuring you’re not plagued by an overactive mind, but as we say, more research is needed. A strong nootropic, a lot of evidence points to Bacopa Monnieri being effective at improving memory, enhancing attention, reducing anxiety and acting as a mild antidepressant. While a lot of studies have been done on the elderly, Bacopa also seems to affect younger generations as well, making it an ideal nootropic. Note that Bacopa needs time to work (in certain studies, impressive results were seen at 8-12 weeks that weren’t seen at all in 5 or less). Most studies have used doses of 300mg – 450mg of bacopa, standardised to between 25% – 45% of bacosides (active compound). Hunter Focus includes 200mg of the leaf extract at 20% bacosides. The lower dose is fairly normal in a nootropic stack (you can’t fit everything in) but it’s a shame the bacoside content isn’t higher. Increases cognition, especially during times of stress, improves mood, and may also improve memory. An excellent ingredient. There is no specific dosage for L-Tyrosine, but a generally regarded dosage for cognitive benefit is 300-500mg of NALT twice a day, though some people may find they react to smaller doses. Hunter Focus contains 200mg, albeit this is taken daily. It is also good to see tyrosine included as the highly bioavailable form of NALT. Again, remember that many retail nootropic supplements typically contain smaller doses of certain ingredients – especially if the body can make them itself or they can be found in food (tyrosine is found in meat, eggs, wheat, fish, dairy products, beans, nuts and oats). Likewise, a nootropic stack can often add up to more than just the sum of its parts if those ingredients are chosen well and work together in synergy. Our favourite nootropic, Mind Lab Pro, for instance, contains just 175mg of NALT and yet its 11 ingredients work so effectively together that it is one of the most effective nootropics on the market. It is quite rare to take theanine without caffeine because the two work together so well. But theanine is an effective supplement ingredient in its own right. It can improve sleep quality (always important for health), massively increase attention, reduce anxiety, and help you relax. It influences alpha brain waves to create a state of relaxed alertness. The dosage in Hunter Focus is just right. May help to boost cognition, particularly in the elderly. The dosage is often recommended as 300mg, but 100mg may also be effective (though obviously less so). An antioxidant-rich nitric oxide booster which can help supply more blood (and therefore oxygen) to the brain. A 2011 study by Luzzi et al found that it can boost cognition, attention and mental performance. Dosing is perfect. Maritime Pine Bark extract is a promising ingredient that we’ve only seen in Performance Lab Mind and Mind Lab Pro so far. There should be zero side effects to taking this supplement, but if you have a health condition or are pregnant you should consult your doctor first. Everyone is different and people interact with supplements in a unique way. The entire Hunter range by Roar Ambition appears to be aimed at an older age group than its other products, such as Instant Knockout and TestoFuel. Older men and women, in their 40s and above, would probably see the biggest improvements from using Hunter Focus, with its emphasis on reducing stress and aiding memory. Hunter Focus is a very good nootropic supplement and should fit in well with the other Hunter supplements. It offers a novel approach to nootropics in that rather than fall back on stimulants, it opts for a calming quality instead. By calming your anxiety and tackling an overactive mind, it allows you to relax and focus instead. Perfect for busy executives or anyone dealing with a lot of stress in their lives. While some ingredients may seem a little under-dosed compared to recommended dosages, it’s important to look at the overall picture here. 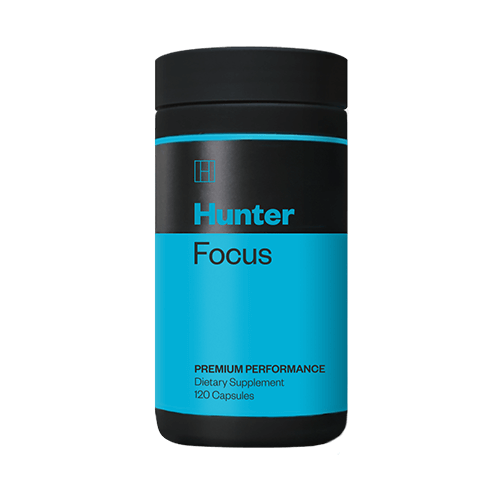 Hunter Focus is a smart nootropic stack. It stacks all-natural brain and cognition boosters with anxiolytic (anti-anxiety) substances such as L-theanine, passionflower and ashwagandha. This keeps the brain fully charged, optimised and in balance. Add ingredients such as Lion’s Mane, Maritime Pine Bark extract and L-Theanine and you have ingredients that offer both a long and short-term boost to the brain. Not something all nootropic stacks can claim. If all the ingredients were at 100% dosage, then this would probably be the best nootropic supplement I have seen, but then we might also have to take another two pills a day. The reality is that most of the dosages in Hunter Focus are not only adequate but as good as, or better, than many other best-selling nootropic stacks on the market. I’ve been really impressed with the Hunter product range in general. High quality supplements with inventive ingredients lists, and often well-dosed ingredients.